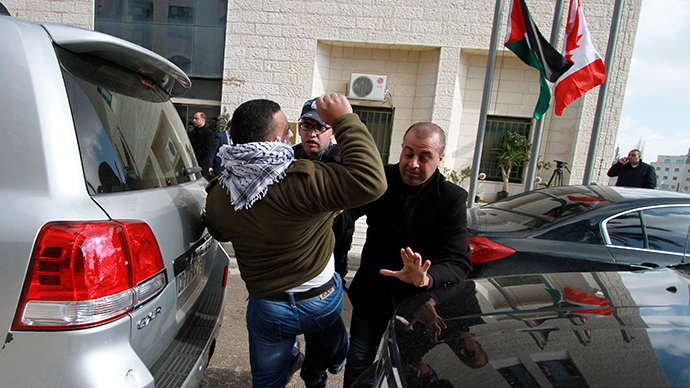 Some 100 Palestinian protesters hurled eggs at Canadian Foreign Minister John Baird as he was visiting Ramallah. Canada is among the nations resisting Palestinian efforts to gain recognition as a state in international organizations. Baird arrived Sunday in the West Bank city to meet his Palestinian counterpart, Riyad al-Maliki. But as he was going to his car after the meeting, a crowd of some 100 protesters that had gathered outside the building started pelting him with eggs, Reuters reported. Several dozen Palestinian guards armed with machine guns did nothing to stop the protesters. Baird was not hit by any of the projectiles, but his car was. "You're not welcome," the demonstrators shouted at the Canadian official, as he was leaving. In a statement, Baird described his meeting with Malki as "cordial and constructive" and included "candid and frank exchanges on areas where we differ in opinion." He is on a five-day visit to the region, with his schedule including meetings with Israeli and Palestinian officials. Canada is a reliable partner for the US and Israel in resisting Palestine’s effort to increase its recognition at the international scene. It was among a handful of nations that voted against Palestine’s obtaining a non-state membership at the UN General Assembly in 2012, while this month Baird called a Palestinian move to join the International Criminal Court "concerning and dangerous". In a statement Sunday, top Palestinian peace negotiator Saeb Erekat said Baird should apologize for visiting Israeli officials in occupied East Jerusalem in 2014. "We regret the Canadian government's decision to stand on the wrong side of history by blindly supporting the Israeli occupation and its apartheid policies," the Palestinian official said. Israel has occupied East Jerusalem along with other Palestinian territories during the 1967 war and has been building settlements there despite overwhelming objection to the practice by the international community. The construction of settlements was boosted under a series of governments under Prime Minister Benjamin Netanyahu, which is one of the sore points making peace talks between Palestinians and Israelis so complicated.